Transform Your Life with Christian Meditation. 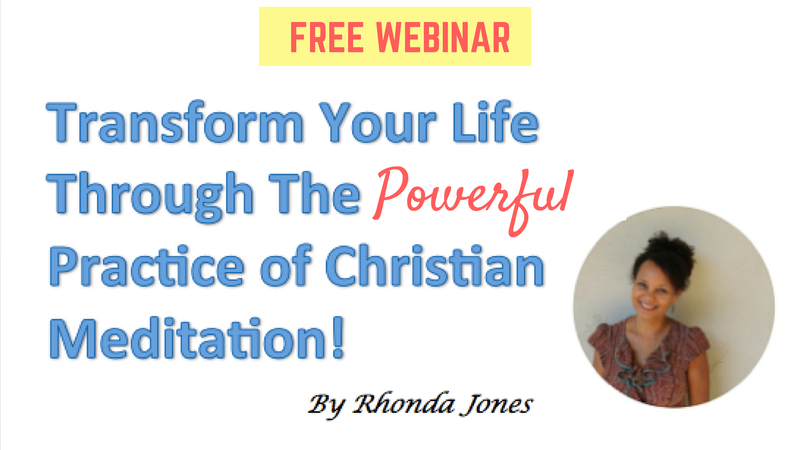 Join Rhonda Jones on this FREE webinar! Are you leaving your mental, emotional, and spiritual health to chance? Too often we focus on the outer world (appearances, material, tangible), but neglect the world within (our mind, spirit, and heart) just because it’s not so visible, but cleaning the outside isn’t enough. If we have a preoccupation with the outside, we may neglect the spiritual importance of seeking God and making Him number one in our life. I’m not saying that you or I operate as these pious religious leaders, but we can glean from these important words that Jesus spoke. Don’t focus so much on the outside, but make your inner life and journey a priority as well. Jesus said in Mark 7:15, “It's not what goes into your body that defiles you; you are defiled by what comes from your heart." Jesus wants us to purify our hearts from all that defiles and creates unrighteousness, but that takes time, discipline, and effort. It just doesn’t happen all by itself. Jesus wants us to go into God’s secret place and learn from Him. He wants us to abide in Him and become one with Him, and that can only happen when we spend time with God! What most people really meditate on? Why you are mostly like unhappy, depressed, and feeling disconnected from God. Why you need to make spirit and soul care a priority? Are you are ready to take the responsibility to heal your life? Why it is so hard to change? Where you are on the healing ladder? She’ll give you many of the reasons why building your life on a spiritual foundation, by incorporating Christian meditation into your life, is a really good idea; in fact, meditating on God is essential for a successful life. To watch this free webinar replay, click on the link below.